Underneath Remind Me Tomorrow’s shimmering melodies and uptempo beats runs a current of darkness and dissatisfaction; Van Etten wrote the album after taking time off from everything to give birth to her first son, then taking time off from music to pursue an undergraduate degree, then taking time off from that when she landed a new acting gig on Netflix’s The OA. Unsure how a step back from the spotlight would affect her carefully crafted career, Van Etten challenged herself to let go, lose control and look farther afield. City Weekly: What’s the one thing different about this current tour compared to past ones? Sharon Van Etten: We’ve only had a handful of warm-up performances, but so far, it’s been fun because the album doesn’t really feature guitar at all. I’m not playing guitar live, except maybe while revisiting some old songs; I’m just going to be singing. It sounds silly to say, but I’ve never really done that before. That’ll be challenging as a performer, but I think it will help my singing. My band has synthesizers and keyboards, along with two multi-instrumentalists, a bass player and a drummer. It’ll still be a very live band feeling, even though it’s a very key-centric record. I like the feeling of a live band. I’m not planning on dancing or playing with backing tracks anytime soon. CW: What motivated you to move from writing primarily on an acoustic guitar to writing on synthesizers? SVE: When you’re playing a synthesizer, you’re hearing tones you wouldn’t hear on a guitar. On guitar, you have to constantly change the chords; on synthesizer, you can hold the chords and sustain them for a really long time if you want them to. I felt like that let me explore the melodies more. Also, I’m playing in lower keys than I would normally. Added to the overall darkness of the record, which is constantly looming, that had me singing in a different register and projecting in a different way. CW: Did producer John Congleton lend a lot of that darkness to the record? Was that by design? SVE: This was the first time that I completely relinquished the demos to a producer and said, “I want you to do your thing.” Up until then, it’s been pretty hand-in-hand with the engineers and producers I’ve worked with. Along the way, everyone was holding my hand. I learned a lot, and I grew as an artist because I learned to work with other people. I went from a solo artist to having a band to directing a band. But I was at a point in my life and career where I felt like I needed to let go of some of that control if I was going to get outside the box that I’ve made for myself. It’s a nice box [laughs], and I like the music I’ve made up to this point, but I wanted to push myself a little further. I felt like it was necessary to open up to more of a collaboration with someone else. That was a big leap for me. CW: Remind Me Tomorrow earned nearly universal praise from outlets big and small, including a glowing profile The New York Times. Has the reception to the record gone according to your expectations? Sharon Van Etten: Honestly, I’m just overwhelmed. I’m a bit more emotional about it than I have been in the past, because I’ve also given myself more distance this time around. I think I feel more vulnerable as a mother leaving my son to go back to work. I feel lucky to have people connecting with it, but I know what comes with that praise. So I’m a little scared [laughs]. My parents even reached out and said, “Are you ready for this?” The answer is, I don’t know. I’m gonna do the best that I can, trying to live up to what the album is. I’m proud of my songs and I feel very humbled by the response. I’m just trying to keep a level head here. CW: You worked in the music industry before launching your career, right? “Seventeen” seems to touch on those heady years a bit. Sharon Van Etten: I worked at Ba Da Bing Records, where Ben Goldberg took me under his wing. I started as an intern and worked my way up to being publicist. I wasn’t the best publicist in the world, but I loved working at Ba Da Bing—I learned so much. Ben ended up introducing me to Greg Weeks, who put out my first record; Ben put out my second record. It was bittersweet to leave the label to pursue a career, but I couldn’t have worked with someone more supportive. CW: Did those lessons shape the way you built your career? 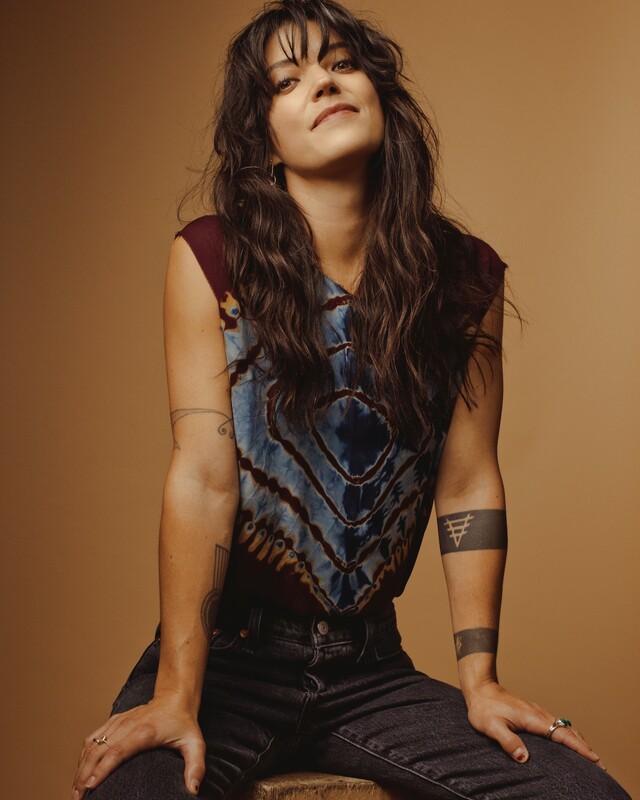 Sharon Van Etten: When I moved to New York, before I thought about a career, albums, a label and an agent, it was, “How do I do this myself?” I was excited about figuring that out. I had no high aspirations about actually making a career. I was just interested in playing music—how’s that work? I reached out to the label originally because I wanted to learn how to cut my own records. I was playing locally, doing DIY shows on the weekends. I was driven, but I didn’t know why or what for. My modus operandi was always, “I’m responding to the people who are responding to my music. I’m performing for the people that are listening. I’m playing at the places and with the artists that are asking me to play.” As I said ‘Yes” along the way, that helped me grow my character, my writing, and my performing. CW: Do you think the blueprint is the same for a young artist today? Sharon Van Etten: It’s a very different now than it was in 2005-06. I had just learned what a blog was. I was learning how to catch up with people via email. I had a flip phone. MapQuest was my savior. But I’m so glad I came up in that time. I kept it grassroots without realizing that’s what I was doing. I built an audience by touring, playing live and responding to people directly—having personal relationships. Even as things have grown, I feel like I’ve sustained that in that same way. As a publicist, I learned that you can be passionate about something and want to share it with people, but even if you reach out to so many people, you’ll get so little response. I’m glad I learned that from a publicity side. I’m also glad I booked my own tours before I had an agent. I know what those eight-hour drives to play for four people are like; I know what it’s like when shows are cancelled. I know what it takes to get in touch with a promoter and advance a show. I’m glad for all of those experiences. CW: Speaking of eight-hour drives, you’ll be playing Denver the night before your show here in Salt Lake City. Do you have a lot of experience here? SVE: I think my first time through there I was tour managing Shearwater and Wye Oak. We spent our free time exploring the nature surrounding the city; it’s so beautiful but so barren and mysterious. Since then, I’ve played a couple venues in Salt Lake City, and everyone’s been so kind, so sweet and so responsive. I’m really looking forward to coming back. CW: One detail that stood out of the press surrounding Remind Me Tomorrow is that you put your music career on hold to pursue a psychology degree, which then got put on hold because of your acting career. Is the degree still something you hope to accomplish? Sharon Van Etten: Absolutely. I won’t be able to go to school this year because of my touring schedule, but I’m trying to give myself a realistic goal of getting some kind of certification to be a counselor by the age of 50. I’ll be 38 later this month, so that gives me 12 years. I’m still finishing my undergrad, and I’m only technically a sophomore, so I’m still catching up on general studies on top of the psychology requirements. I’m learning a lot, though; in addition to the psychology classes, I even took a music class! I still have a long way to go, but I’m being gentle with myself and setting realistic goals.